Looxcie has announced the launch of Looxcie (look-see), the first small, light, easy-to-wear camcorder that videos everything the user sees. A Bluetooth-enabled headset, Looxcie fits comfortably on the ear and points where the user looks. Because it is always on, always videoing, users never have to worry about pressing a record button or missing a key event. When an unexpected moment occurs, a press of the instant clip button captures the last 30 seconds of video and stores it as a permanent clip on the device. Users can immediately share their clips by email while they're fresh and relevant. The accompanying Looxcie smartphone application also turns the phone into a viewfinder, remote control and editing tool for creating clips up to 30 minutes in length. Looxcie utilizes a dual processor system for video and Bluetooth communication so the headset can operate in video mode and talk mode at the same time, or separately. Looxcie uses a mini processor for Bluetooth that includes a digital signal processing system to process and optimize the audio. The camcorder's mini video processor includes software by Looxcie that optimizes power use, automatically corrects for light and color, and formats video for mobile devices. These processing systems operate concurrently so users can simultaneously handle calls and capture video. Looxcie currently operates with the majority of Android 2.0 and higher smartphones, with support for additional smartphone operating systems forthcoming. Clips can also be uploaded to a Mac or PC via the USB connector for archiving, viewing, editing or additional sharing. Users can also pre-program an Instant Share recipient so that when they "long-press" the instant clip button, Looxcie automatically sends the clip to the pre-determined email address. A complete list of compatible phones is available at http://www.looxcie/looxcie-app.html. Looxcie is available for sale at Amazon.com for a suggested retail price of $199. 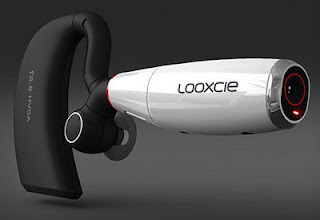 0 comments on "Looxcie is a Bluetooth Headset with camera"